The second half of the twentieth century saw the world’s energy trade pivot on the flow of oil from the Gulf Cooperation Council Countries (GCC), namely Kuwait, Saudi Arabia, Qatar, Oman, Bahrain and the UAE, to the United States and Europe. The first half of the twenty first century looks set to see the flow of hydrocarbons going East to the emerging economies of India and China. These two rising powers, (unlike Russia and Brazil which have their own domestic sources), are increasingly dependent on energy imports, and so the security, safety and reliability of this supply will weigh heavily on the minds of foreign policy strategists in New Delhi and Beijing. 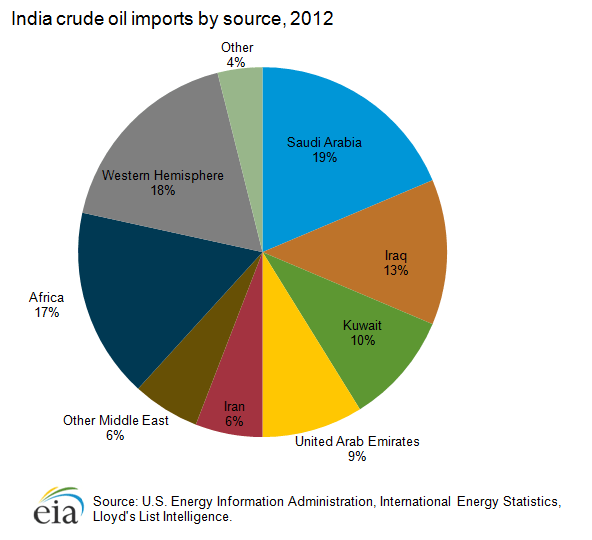 Both India and China have outgrown their domestic sources of energy, primarily coal and oil respectively, and despite much attention being placed on their trade and investment activities in Africa and a lesser extent Latin America, where they have been actively securing oil acreage and coal imports, much less attention has been placed on their dependence on the GCC and Middle East. Saudi Arabia has seen China become its biggest customer of crude and the Chinese have also been happy to trade with that pariah (to the West) Iran. India has long had the UAE as its biggest trade partner (bar the EU) and what some are calling the “Chindia – Middle-East” axis is just beginning. The Gulf region has deep long lasting reserves of oil, which means when the supplies from some African and Western countries reserves dry up, they will still be going strong. It also means that China and India could be the countries mediating in disputes and sending troops to a region that will increasingly be seen as their core interest, because if the price of oil spikes or is cut off, their economies will collapse with frightening speed. The main brake on the future development of this relationship will be the application of new technology. The speed and reliability of renewable energy sources and/or shale gas has the potential to make the use of oil fair less critical. The price of solar energy in particular is falling fast, and if subsidies from fossil fuels were eliminated, it would look even more attractive. Solar energy has huge obvious potential in both India and China, indeed its share of energy supply is creeping steadily upwards and could still rescue the two countries from becoming over dependent on oil.